Last month my cousins were over from the UK. So as part of the Mumbai tour, we hung outside Mannat - Shah Rukh Khan's villa at Bandstand- for a dekko. To no avail - all we got was overhearing one security guy telling another that "Saab abhi nikala hai. Dhyaan rakhna". We did however get a peak at his fleet of BMWs from the gate of the complex (the one on the side road which leads up to Mount Mary Church). This led rise to us discussing the newspaper report that SRK's cars are all BMWs numbered 555. Moving on from Bandstand, we went off for dinner and a drive later along Carter Road around 11:30 pm. Suddenly a vehicle zoomed past us - and my cousin quite casually mentioned - "Hey there's a silver BMW ending in 555 - Didnt you say SRK drives in one of those?" "Oh is it really him?" So we revved up behind the car - honking off a rickshaw and everything else that appeared in between. Getting closer - we saw the car led by a Gypsy with blinking lights and 3 security guys. 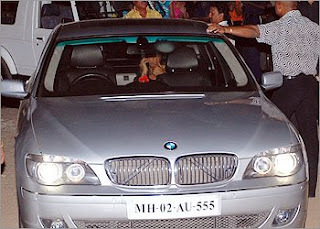 Also the BMW was a 7-series sedan - so good chances that this was SRK's car with him in it. We caught up soon enough (or rather they got bogged down in the traffic on Perry Road) and we finally stopped at the red signal - parked parallel to this car. My wife and cousins waved and danced like true mad fans - yelling "Shah Rukh Shah Rukh" - hoping he'll pull down the dark windows and wave back. Well - the story ends on that disappointing note. After probably observing us for some time (and ensuring we're just crazy fans and not a threat - sure the security recorded my car number as well) the BMW and Gypsy cars cut through the red signal and drove off. We thought of following but noticed the 2 traffic policemen standing just ahead of the signal. We drove back home all hugely disappointed - "Arrey Hum Bhi Santrowale hai *" so he could have allowed us a smile or a wave. And were we behind the wrong car? Luckily a quick Google search on the car number MH 02 AU 555 solved that one. I got the photo below on a blog site.